A Storm of Epic Proportions. The critically acclaimed Naruto Shippuden: Ultimate Ninja Storm series is back in 2013 on PS3 and X360, celebrating the return of highly awaited boss battles and welcoming brand new features to revamp the game experience. More immersive, more faithful and more extreme, Naruto Shippuden: Ultimate Ninja Storm 3 will offer the most epic Naruto experience ever seen in a video game. Dattebayo! 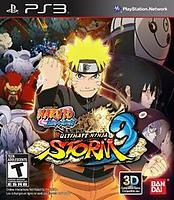 Absolute Immersion - NARUTO SHIPPUDEN: Ultimate Ninja STORM 3 offers the most immersive and epic Naruto game ever created. Bigger Scale Boss Battles - Boss Battles are back and more impressive than ever before. Prepare to battle through an entire village in a huge boss battle with Nine-Tails. Authentic Naruto Experience - Play through the anime-driven story mode and relive the most recent events of the animated series with a degree of faithfulness never-before-seen. Nine-Tails Attacks Konoha - The Story mode starts out with the heated invasion of Nine-Tails! Help Hiruzen and Minato defend the village against Masked Man and Nine-Tails.